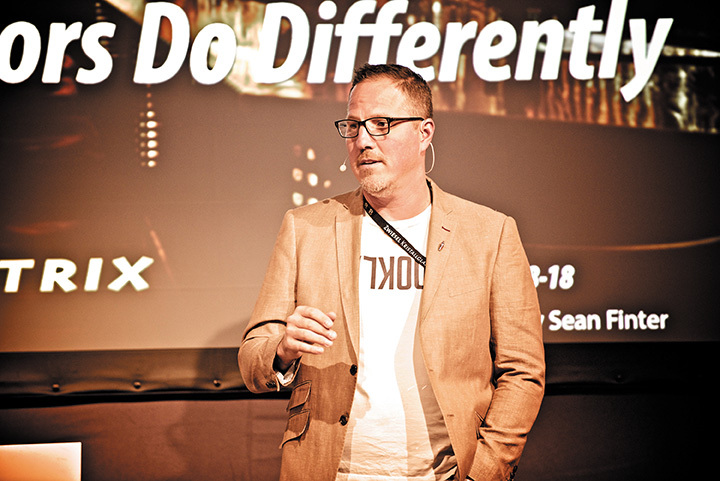 "I don’t value starving artists and there are a lot of starving artists in this industry.” Sean Finter is just getting into his flow, speaking at Bar Convent, the world’s biggest bar show, to a room packed with on-trade operators keen to discover how to better turn a profit. Challenging words, but how to do this is a world where margins are wafer thin, customers fickle, quality staff hard to find and harder to hold on to, and the vagaries of fashion often dictate a short shelf life for many styles of outlet? For Finter a simple answer is that less is more, and rather than fiddling around at the edges of the business trying to introduce time-consuming new add-ons, bar and restaurant operators are far better off looking to be “brilliant at the basics”, starting with the revenue cap during peak periods of trade. Recommending that people look to “milk your cows”, Finter evoked the well-known but often surprisingly overlooked 80/20 (or Pareto) rule, which roughly translates as 20% of activities will deliver 80% of results. For a typical restaurant or bar, this suggests that 80% of profit will come from just 20% of peak operating time – i.e. the busiest times of the days on the busiest days of the week when a narrow window allows the kitchen or bar staff to go all out to meet peak customer demand. You may not physically be able to get any more customers in through the door, but you can improve on the speed and quality of service and this can impact positively on the bottom line. “Make money – you take 80% of revenue in 20% of operation time, so look to optimise before going off and doing crazy things,” said Finter. Easy to say, of course, but surely harder to do? Finter says not, advising that owners and managers should consider the Hawthorne effect, which suggests that anything you focus attention on will, inevitably, improve. And that attention is best spent on getting the basics well oiled, one step at a time. To focus on the 15 or so hours a week when 80% of revenue is generated, a business needs clear goals. To begin with, it’s a good idea to identify the revenue cap, then complete an audit of the business and identify where changes can be made. Then tackle these one at a time, perhaps prioritising one new area to focus on each month. These can be as simple as looking at where bottlenecks occur, slowing down staff, or ensuring that the biggest-selling cocktails and food dishes can be made perfectly each time by the whole team, and not just by the leading mixologists and chefs who dreamt up those creations. And whatever the key issues to overcome, make sure you teach the basics first and teach them well, time and again. “Set performance criteria, set goals, measure it, people will get better and you will drive up the revenue cap,” said Finter. Committed staff drive a strong business, and outside consultants and expensive training are not necessary to help improve staff efficiency and engagement within the business. Finter argues that instead the business owner should set out clear goals, be highly transparent about revenue and profits, and lead by “slowing down, meeting people where they are and then taking them along”. Other advice includes inspecting and talking to people about their work (leadership to which they respond well), and ensuring that there are no dead-end jobs by putting in place a clear path of progression, perhaps as a three-year plan with identifiable quarterly objectives and targets. By being “brilliant at the basics”, Finter cited top businesses as only losing between 1%-3% of their inventory, while having only single-digit staff turnover per annum, and suffering no drop in standards when the owner or GM has left the building as they have typically “maximised the discretional effort of the team”, so that they step up and treat the outlet like their own business. In a highly competitive and uncertain world where only the fittest thrive, while others often struggle to survive, it is refreshing to have a seemingly simple path to greater success mapped out and one that appears to be fully within the reach of pretty much any on-trade operator. “You can rig the game,” Finter insisted, adding, simply, “the difference with entrepreneurial people outperforming the market is that they do these things”.